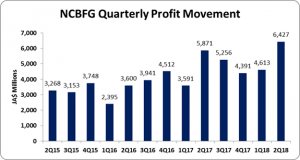 NCB Financial Group (NCBJ) for the six months ended March 31, 2018 reported Net Interest Income increased by 8.66%, relative to the corresponding period in 2017, to total $15.91 billion (2017: $14.64 billion). The Company noted this was “driven by the consolidation of our newest subsidiary, Clarien Group Limited (CGL).” For the quarter, Net Interest Income improved 12.41% to close at $8.36 billion (2017: $7.43 billion). Interest income rose 16.81% year over year for the six months to $24.28 billion compared to $20.78 billion in 2017, while interest expense amounted to $8.37 billion relative to $6.15 billion for the corresponding period in 2017. Net Fees and Commission Income amounted to $7.72 billion, an increase of 10.76% versus 2016’s $6.97 billion. The company highlighted the performance was, “mainly as a result of higher transaction volumes for point of sale and e-commerce channels, increased investment banking and pension fee income and the consolidation of CGL”. The bank also reported a gain on foreign currency and investment activities of $7.17 billion, a growth of 96.92% relative to $3.64 billion in 2017. Premium income for the period also increased 15.97% to $4.31 billion (2017: $3.72 billion), while dividend income increased 95.91% to a total of $207.37 million (2017: $105.85 million). Other Operating Income climbed by 332.57% to $422.44 million (2017: $97.66 million). Consequently, total operating income increased 22.51% to a total of $35.73 billion (2017: $29.17 billion). Total operating income for the second quarter recorded a 27.37% growth to $19.04 billion (2017: $14.95 billion). Other operating expenses grew by 7.05% to $8.59 billion (2017: $8.02 billion). Provision for credit loss increased from $347.35 million in 2017 to close at $432.48 million in 2018. Depreciation and amortization grew 39.95% to $1.54 billion relative to the $1.10 billion recorded in 2017. Consequently, operating profit increased 7.74% to total $10.82 billion (2017: $10.05 billion). ‘Share of profit of associates’ declined 10.02% to total $1.48 billion compared to $1.64 billion in 2017. The bank also reported a ‘Negative goodwill on acquisition of subsidiary’ of $1.47 billion. Consequently, profit before taxation increased 17.79% to $13.77 billion relative to $11.69 billion in 2017. Following taxation of $2.73 billion (2016: $2.23 billion), net profit for the six months ended March 31, 2018 totaled $11.04 billion, an increase of 16.69% compared to $9.46 billion for the corresponding period of 2017. Net profit for the second quarter improved by 9.48% to close at $6.43 billion (2017: $5.87 billion). Earnings per share (EPS) for the six months ended March 31, 2018 totaled $4.48 relative to $3.84 booked for the comparable period of 2017. The EPS for the second quarter amounted to $2.61 (2017: $2.38). The trailing twelve month EPS amounted to $8.39. The number of shares used in our calculations amounted to 2,466,762,828 units. NCBFG stock price closed the trading period at a price of $95.07 on April 26, 2018. Total Assets increased by 39.35% or $251.50 billion to $890.66 billion as at March 31, 2018 from $639.17 billion a year ago. This increase stemmed mainly from the growth in ‘Loans & Advances, Net of Provision for Credit Losses’ from $207.29 billion to $334.30 billion, a 61.27% increase. The Bank noted, “In addition to the consolidation of CGL, there was growth in all our business segments’ loan portfolios: retail up 22%, corporate up 11% and credit card receivables up 25%.” Other notable contributors to the increase in the asset base was ‘Pledged Assets and ‘Investment securities’ which rose 29.44% and 12.59% respectively to $134.63 billion and $219.92 billion respectively. Shareholder’s Equity as at March 31, 2018 stood at $124.95 billion relative to $106.41 billion a year ago. This resulted in book value per share of $50.65 (2017: $43.14).